Description: This is a relatively small sea scorpion which reaches a maximum length of 17.5cm. It has a distinctive barbel at the corners of the mouth and a long spine in front of the gill cover. The lateral line is spiny but there are no spines either side of it. The colour is very variable and changes to camouflage with the surroundings. It is often red with pink mottling when living on rock covered in pink coralline algae and greenish-brown when living amongst brown seaweed. Habitat: The long-spined sea scorpion is common in rockpools and beneath seaweed on the low shore and also sublittorally amongst seaweed covered rock down to 30m depth. It feeds on small bottom-living fish and crustaceans. Distribution: The long-spined sea scorpion is common all around the coasts of Britain and Ireland. Similar Species: This species is sometimes confused with the bull rout (Myoxocephalus scorpius) but can easily be distinguished by the presence of a barbel at the corners of the mouth. 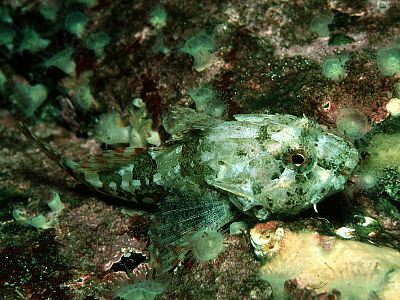 The Norway bullhead (Taurulus lilljeborgi) is very similar but tends to occur in deeper water (below 20m) and is confined to the coasts of Scotland and Northern Ireland. In the Norway bullhead there is a row of spines on the skin above the lateral line. Picton, B.E. & Morrow, C.C. (2016). Taurulus bubalis (Euphrasen, 1786). [In] Encyclopedia of Marine Life of Britain and Ireland.